The brief for this project was to reconfigure the rear of an existing residence to respond to a new laneway-accessed garage + storage area, as well as to renovate two existing bathrooms, increase the size of two existing bedrooms. The re-configuration allowed the existing sizable master bedroom to be split into bedroom, corridor and external porch. Finally, the works included associated external works. The desire was to model the new structure – the garage + storage area – as an object that could be associated with the rear laneway more than the existing house. 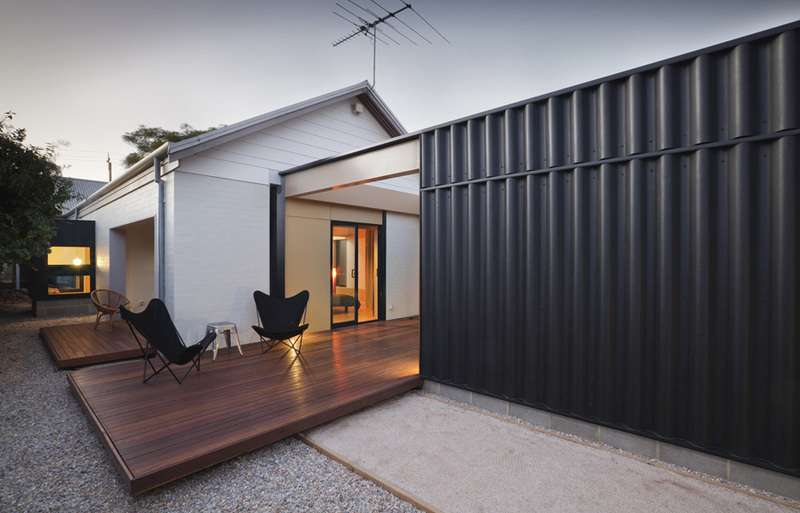 It was conceived of as an addition to the existing landscape of garages, sheds + super-six fencing. We therefore decided to clad the structure in the ubiquitous fencing product. To articulate the autonomy from the existing home, the supersix cladding is carried to the inside where it is encountered at the end of an existing corridor. The supersix defines the limits of a rectangular volume that is pushed into the existing fabric of the home (the former master bedroom) and contains the garage, storage, walk-in-robe and reconfigured bedroom. The space between this box and the limits of the previous master bedroom becomes a corridor that leads to the newly created northern porch and to the bedroom in the other direction. A heavy drape allows the bedroom to be further divided to define a loose corridor providing access – via the storage room – to the garage. The new structure was built from SIPS, an insulated sandwich panel, that was left exposed internally and painted white. The new bedroom is given a new raised plywood floor to differentiate it further from the existing house. Plywood is used to line walls and for cabinetry as well as high-level pelmets. The walk-in-robe is finished in full-height white cabinets. The supersix volume has a courtyard at its centre. This allows the junction between old and new to remain open and legible. This north-facing courtyard is accessible from the master bedroom and has yet to be fitted with a wire trellis to provide sun control. The courtyard extends beyond the supersix box through a timber deck. A second deck mirrors the first and spills out from the new porch. Two existing bedrooms are given new ‘bay windows’ or ‘pods’ as the client described them. They increase the perceived space of these rooms and offer a new place to sit. Finally, the bathrooms, which were Phase I of the project, were remodelled completely. The original house was architect designed in the 80s. It has been extended twice since, and now a third time. The clients have lived there for close to 30 years. The task was to provide modifications to the house, which would make it relevant to their lives for yet another decade. This is a powerful sort of sustainability: commitment to one place.